On Dec. 4, 1969, law enforcement officers raided a home at 2337 Monroe St. in Chicago. First they killed Mark Clark, who sat by the door with a shotgun. Then they trained their gunfire on the south bedroom and opened fire. When the cops stopped firing, they pulled the 21-year-old chairman of the Illinois Black Panther Party out of the bullet-riddled room. After the officers noticed that he was still alive, they pumped two more bullets, at point-blank range, into the center of Fred Hampton’s forehead. Despite Martin Luther King Jr.’s protests, the March on Washington and activism, King was assassinated only when he reached beyond race and began talking about class and economics with his Poor People’s Campaign. Malcolm X was gunned down after he talked about including whites in the freedom movement. I first met Zac Henson a few years ago when we were both invited to a forum in Birmingham, Ala., to talk about economic development. He has an unkempt beard and talks with a Southern accent as thick as Karo Syrup. He looks like a redneck. He sounds like a redneck. I figured that I would be the lone voice railing against the gentrification of one of the blackest cities in America, until he spoke up. It turns out that Henson is a redneck. It also turns out that Henson is a UC Berkeley-educated economist and scholar with a Ph.D. in environmental science, policy and management and heads the Cooperative New School for Urban Studies and Environmental Justice. Henson doesn’t consider the term “redneck” a pejorative, and defines a redneck simply as “a white working-class Southerner.” He has been working for years to separate redneck culture from its neo-Confederate, racist past and redefine it according to its working-class roots. Henson is one of the people trying to renew the legacy of the Young Patriots and build the anti-racism redneck movement. He is one of the people trying to spread the message and history of the Young Patriots Organization and its connection to redneck culture. The original YPO was led by William “Preacherman” Fesperman and made up of “hillbillies” from Chicago’s South Side. They saw the similarity in how the Chicago machine treated blacks and how it treated poor whites. Preacherman believed that solidarity was the only answer. Modeled after the Black Panther Party, the YPO adapted the Panthers’ ideas into its platform. It used an 11-point plan (pdf) similar to the Panther Party’s 10-point plan. It opened a free health clinic like the Panthers. The YPO, too, was raided by the “pigs” (pdf). Today the Young Patriots Organization is looking to build on the legacy interrupted by the death of Fred Hampton. It embraces the term “redneck” as a cultural term and wants to build a movement that fights racism the same way as the Black Panthers it modeled itself after almost five decades ago. Henson, Thurman and the YPO chapters across the country are using their history with the Panthers to fight racism, class warfare and oppression on all fronts, and they are rounding up unafraid rednecks willing to fight the power structure in any way possible. We are not pacifists. Redneck Revolt believes in using any and all means at our disposal to gain our freedom and true liberty, provided those methods do not violate our basic humanity or integrity. We believe in the inherit right of every individual and community to defend themselves from those who exploit or oppress them. We believe in empowering each other to participate in the defense of our communities with the knowledge and equipment to do so. It is our duty and obligation to defend our families and communities by all means from those who profit from our misery and destruction, or call for violence against any of us for our race, gender, religion, country of birth, or cultural background. White supremacy is a system that white working people have helped protect, but it is also used as a tool against all working people, with people of color impacted the most severely. Allegiance to a politics of white racism has only allowed the rich to continue to hold onto power, with no lifting effect to working class folks of any race. Redneck Revolt actually showed up at the Unite the Right rally in Charlottesville, Va., when, it says, it was asked by locals to provide security at Justice Park. 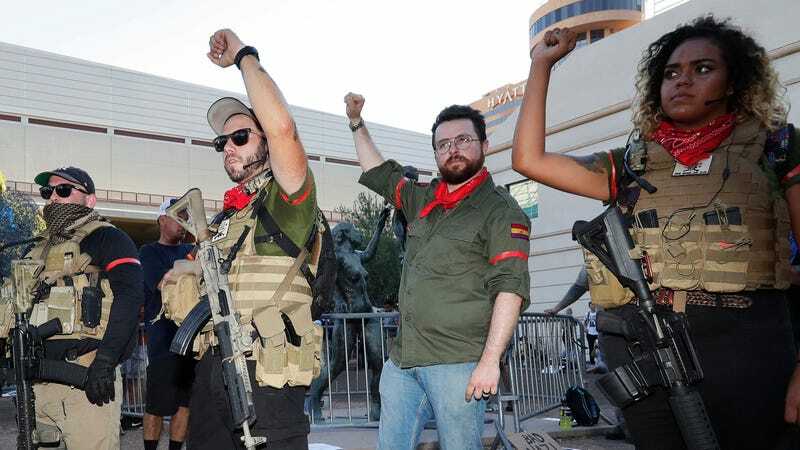 Even though Redneck Revolt members were armed, ready and “refused to blink,” Shaun, from Pittsburgh’s chapter of Redneck Revolt, admits that they were surprised by the large number of fascists in attendance. Redneck Revolt considers itself to be the opposite of right-wing groups like the Oath Keepers and the III% (aka the Three Percenters). Redneck Revolt members not only use their organizing power to recruit and protect communities, but they also meet with other militia groups to spread their message of anti-racism. Redneck Revolt has filled its ranks with members like Russ, from the New Orleans chapter who described how he grew up poor, in a trailer on the edge of a rural Southern town. Explaining that no one in his family, including himself, attended college, he is the prototypical southern redneck, except he doesn’t adhere to white supremacy.